Perfect World Entertainment has announced Remnant: From the Ashes, currently in development by Gunfire Games. 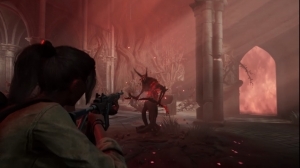 Remnant: From the Ashes is a third-person survival-action shooter set it a post-apocalyptic world. Featuring dynamic worlds, customizable characters, co-op support, gear and weapon crafting, enemies and bosses, and dynamically generated levels, Remnant: From the Ashes is set to release in 2019 on PC, Xbox One, and PlayStation 4.